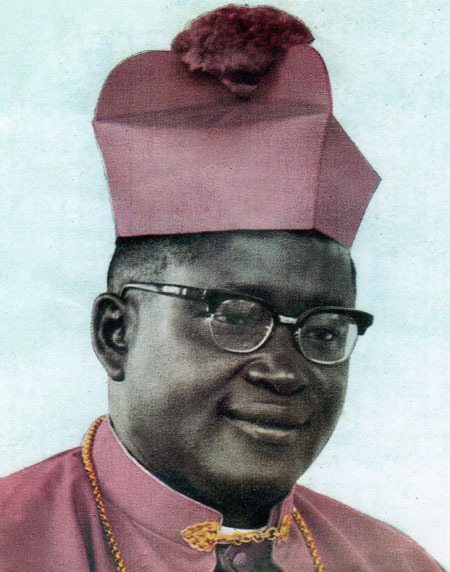 Bishop Cyprian Biyehima Kihangire was born at Hoima on 19th Mar 1918. He was ordained a priest on 17th February 1951. He was appointed Auxiliary Bishop of Gulu and Titular Bishop of Maura on 12th November 1962 and ordained on 24th March 1963. On 20th January 1964 he was appointed Bishop of the Uganda Military, a post he held until his resignation on 5th January 1985. He was appointed Bishop of Hoima on 9th August 1965 as such becoming the founding bishop of Hoima Diocese until 19th of December 1968 when he was appointed Bishop of Gulu. When Bishop Cyprian Kihangire was appointed Bishop of Hoima, 9th, Aug 1965. he was told to begin a minor seminary as well so as at foster many young vocations to priesthood. And so Bishop Kihangire encouraged the parents, teachers, school children and catechists to pray every day the prayer for vocations to Priesthood for Hoima Diocese. In Jan 1967 St. John Bosco minor seminary, Bujumbura, Hoima, began with only 13 boys for secondary education. Today 50 years after the Diocese began, we are witnessing a big rise in vocations to priesthood, with many minor and major seminarians and also with many native priests of Hoima Diocese. The presence of many priests are the result of the prayer that Bishop C. Kihangire encouraged the Christians to pray asking God for priests. As of 2015 Hoima Diocese is getting an average number of 10-12 priests per year.